I drew this for a Nice calendar project. It’s labeled “A December Pinup in July,” but now, thanks to the magic of Narbonic: Director’s Cut scheduling, it’s been transformed into a December pinup in December! I actually did an okay job on the coloring; the computer-assisted bits (the sky, trees and glowing mutagen) don’t clash too much with the Prismacolor pencils. I drew these kiddie versions of the characters a lot. The versions of Dave and Helen we see here look pretty much like the actual childhood versions of the characters we see in other Narbonic strips, but this version of Mell doesn’t look that much like she does in the Narbonic spinoff Li’l Mell. At this time, Li’l Mell was not yet so much as a glimmer in Lea Hernandez’s eye. Post-Calvin and Hobbes, there is unfortunately only so much a cartoonist can do with killer mutant snow goons without blatantly ripping off Bill Watterson. 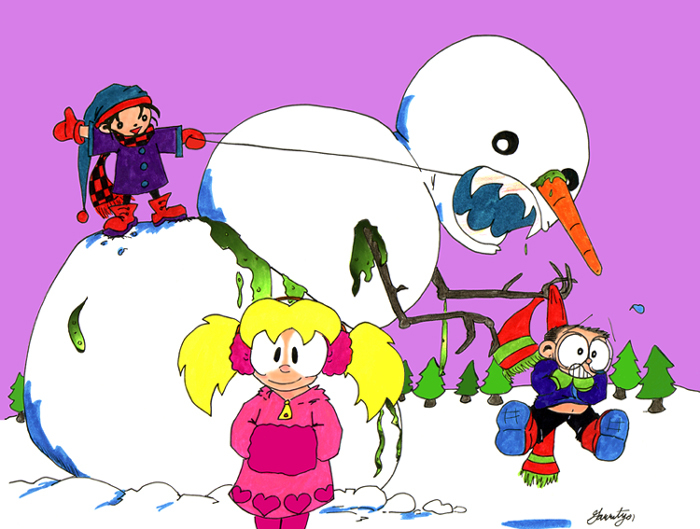 But Watterson got the “snowmen as art objects” running gag from Charles Schulz, so whatever. You know what else you want to see? More daredevil gerbil photos! Once again, James Rice has taken his gerbil, Speedy, to the Bonneville Salt Flats to ride some of the world’s fastest land vehicles. Writes James: “The pick of fast vehicles this was limited by salt conditions that were worse than last year, but Speedy still managed to score an interesting ride on the world’s fastest hydrogen fuel cell car, the Buckeye Bullet II. “In August, after the first meet of the year, I ran into the Buckeye team, and when they recognized me, they immediately asked about Speedy, since he had ridden with them on the first Bullet, setting an electric car record back in 2004. I caught them up on his adventures over the last few years, and showed them the Speedy artwork you sent me. I found them again at the October meet, and the driver was thrilled to be able to take Speedy in their new car. Unfortunately, there were a number of problems that cropped up, but Speedy was still able to get in a couple of runs over 200mph. Oh, Yeah. I had forgotten that I sent those photos to Shaenon. Speedy’s fame at the salt is growing. So far he’s been on actual world record runs for the world’s fastest electric car, open wheel motorcycle, Formula 1 car, NASCAR, diesel car, and fuel cell car, (and probably a few others). Magenta skies. What’s up with those? I’ve seen them in quite a few cartoons now, but still can’t make head nor tail of them. In the December image, miniHelen is really cute! This is my first exposure to Lil’ Mell and Sergio. There doesn’t seem to be any way to date the strips over there… is LM&S still updating, or is it frozen in amber? Li’l Mell was on hiatus for about a year, while the current artist worked on a graphic novel, but it’s been running weekly again for about a month. And oddly, christmas in july is, in the reissue? Right near Christmas! Funny how things work out that way.